While illegal logging among indigenous communities in Darien and other areas continues over 20,000 volunteers turned out across the country on Saturday, June 2 to plant tens of thousands of saplings of timber, fruit and ornamental species. The initiative, in its fourth year, took place in 40 different locations and is part of the Alianza por el Millón, which involves public and private entities is aiming to repopulate one million hectares by 2035. President Juan Carlos Varela highlighted the ecological and touristic value of the days, launched in 2015 with "over 5 million trees" already planted. “On these days, full of good vibes, family atmosphere and teamwork, we do not regret putting environmental needs as a priority," said Varela. According to official data, in the four years of the initiative, "we have advanced by 15 percent in the goals of reforestation in degradation points". "40,000 hectares have been reforested with species such as oak, laurel, teak, pine, cashew curacao, espave, avocado, cedar, guayacan, Panama and jacaranda. On average it is reforested with more than 60 species considered the most appropriate by scientific studies for the restoration," said the Presidency in a public statement. The Alianza por el Millón reforestation initiative seeks to strengthen the commitments assumed by Panama in the Paris Agreement, through the increase in reforestation in critical points and the increase in forest cover, which in turn has an impact on the efforts to reduce greenhouse gas emissions. The program of the Alianza por el Millón implies actions in the restoration of forest land; commercial reforestation; conservation of natural forests, and restoration of gallery forests. The National Association for the Conservation of Nature (ANCON) estimates that each year about 20,000 hectares of land are lost due to deforestation in Panama, and that in total 2 million hectares are degraded, of which only 14 percent have been recovered. . According to a report published by the UN in 2014, the reduction of forest masses between 1992 and 2012 resulted in a loss of 3.7 billion dollars for the Panamanian economy. The report explains that the contribution of forests to the economy of a country can be measured through the gross domestic product (GDP), since the forest sector is part of a production chain that directly or indirectly affects the agricultural, industrial, construction and manufacturing sector. The jungle province of Darién, on the border with Colombia, and the indigenous Ngäbé Buglé region, in the Panamanian Caribbean, are the most affected areas by deforestation. Interesting how the article mentions "While illegal logging among indigenous communities in Darien and other areas continues.." as if the Indigenous are largely responsible for deforestation. Classic rabibIanco bs. I lived and worked in the Darien for over two years &amp; highly doubt the never-ending train of tractor trailer &amp; logging trucks seen hauling enormous logs out of the Darien region were owned/controlled by Indigenous tribes. Cutting a tree here and there to use as firewood, or clearing a hectare here and there for sustenance crops, does not deplete the rainforest. Multinational logging and crop companies who pay off government officials to look the other way &amp; take advantage of cheap local labor to mow down the trees is what depletes the rainforest. Isn't this basic knowledge? Quit conveniently sloughing off responsibility on Indigenous tribes, who generally take significantly better care of the forests (they live there after all) than the rest of us. 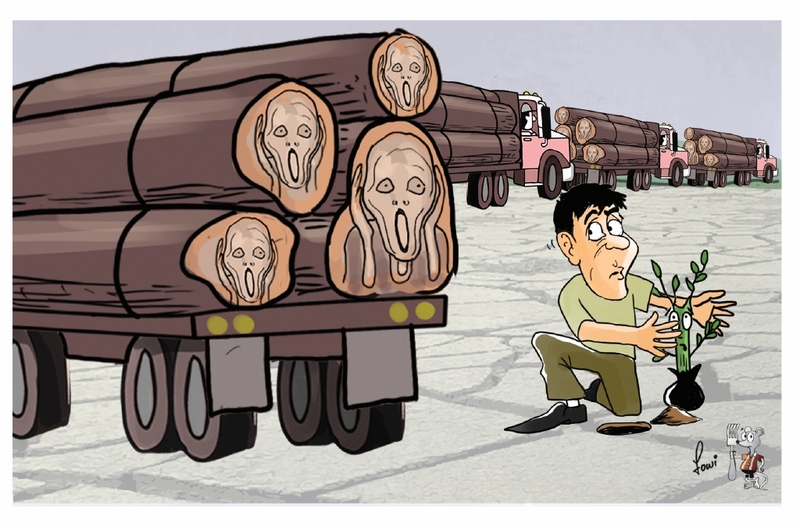 what is the motivation for deforestation? are the trees being sold for lumber or burned for firewood? if they're being sold, then there must be some means offered to replace that income stream with something sustainable. if they're being burned, then access to another way of cooking would be helpful. the efforts of reforestation are essential, but somewhat futile, if the need for deforestation is not also addressed.